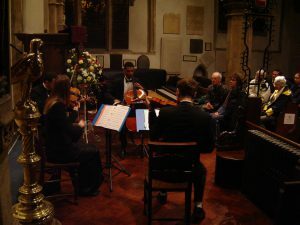 String Quartet Concert at St Michael in the North Gate Oxford -On Friday, the Manor House String Quartet were to perform the second Christmas concert at the Church of St Michael in the North Gate in central Oxford. Keeping the programme quite similar to the concert at St Giles the week before, we still¬†scheduled in a day of¬†rehearsal as Reiad (Viola) was due to play in place of Adrian who had other¬†orchestral commitments. With the weather taking a decidely wintery turn, I was a little anxious to wake up and see the village covered in a blanket of snow but all three other players arrived on time despite difficult driving conditions and we began rehearsing. It went very quickly this time as three of us were already familiar with the¬†music and largely due to Reiad’s excellent sight reading and ensemble skills, there were very few pieces that needed much work. Warming everybody up with some festive musical treats! With the road outside our house becoming increasingly covered in deep snow, we were disturbed by a knock at the door – the refuse collectors were trying to get their lorry through and were asking all the cars to be moved off of the street, with the lorry sliding perilously on the ice. On venturing outside, we found ourselves suddenly embroiled in an impromptu snowball fight with some local children who pelted us with snowballs as we got into the cars and were delighted when Tony (cellist) started throwing a few back using the refuse lorry as cover. Once the excitement had passed we resumed rehearsal on (appropriately enough) ‘Winter’ by Vivaldi, by this point relating completely¬†to Vivaldi’s description of ‘slipping and sliding around on the ice’. As we wanted to arrive in Oxford in good time to meet Bob (the vicar who was to let us into the church), we set off whilst it was still light with the plan of rehearsing the final 3 pieces once we were in the church. Driving conditions were difficult and we began to worry whether any audience members would turn out at all on such an evening. Our worries were not helped by arriving at the church and finding that there were no posters or leaflets up about the concert – this was due to a very unfortunate turn of events as Francis (the Church Administrator who helps organise the concert series and who we like very much) had become ill understandably the last thing on anyone’s minds was organising our posters. As the time for the concert drew near, we realised that if we were to get any audience at all, we would need to go out there and advertise it ourselves. Bob was incredibly helpful, providing us with photocopying facilities, felt tip pens, an advertising board and some large sheets of A2 paper to make posters so we abandoned the idea of rehearsal and got to work. 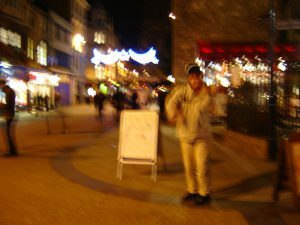 With several other classical concerts on in Oxford that evening, we had our work cut out with finding an audience so decided to literally take to the streets with a placard, leaflets and eventually I¬†stood outside the church¬†and played my violin in the snow. Apart from several people thinking I was busking and trying to give me money, all this seemed to work because by the time we opened the doors to the church, an audience of 22 people turned up, many of whom were tourists in Oxford and liked the idea of taking in an impromptu string quartet concert in the oldest building in Oxford, performed by candlelight. Despite the freezing conditions, our worry about Francis and the chaos of the whole day, this concert took on a magical feel – the intimacy of the audience, the mulled wine we gave out during the interval and the magnificent acoustics in the ancient church will make this a concert all of us will remember. By the end, most audience members came up to us and said how special it had been and some commented how touched they were by the music – in particular a couple from New Zealand who had only arrived in the UK the night before. It felt like we were performing amongst friends and although we do wonder whether Oxford is so saturated by classical concerts that it might be better to find a different venue next year, several audience members asked to join our mailing list and perhaps with a different set of circumstances, a similar event could be made to work in the future. On the way out the door we received some very encouraging news from the Church Warden (David) who let us out of the building and locked up – he had visited Francis and although he is still very unwell, he was reported to be in good spirits and making progress – we wish him all the very best and look forward to playing at St Michael in the North Gate again in the very near future, it certainly is a very special church.